Starting today, 888Poker is giving away up to $1 million in cash prizes and other goodies to players who participate in the site´s Golden Pyramids promotion. For the next couple of months it could be worth your while to spend some time playing at 888Poker. The site has just released details of its Golden Pyramids promotion – a promotion that offers players the chance to share in up to $1 million in cash prizes, free casino plays, free sports bets and 600,000 Gold Tokens that can be redeemed for more cash, bonuses and tournament entries in the 888 Poker Club. The promotion starts today and runs until July 30th, during which time players will be invited to qualify for up to seven daily freeroll tournaments and a weekly freeroll final paying out a total of $640,000 in cash prizes. Players are also being invited to spin the “Wheel of Ra” each day in order to add extra value to what already promises to be a potentially lucrative promotion. Pharaoh Tournaments take place four times each day at midnight, 2:00pm, 4:00pm and 9:00pm (all times GMT). Each one of these lower entry tournaments has a $500 cash prize pool and the top 3,000 players in each Pharaoh Tournament progress up the Golden Pyramid to the next tier. 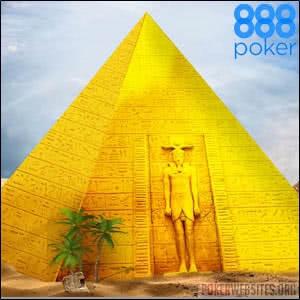 Players will receive an email from 888Poker with details of how they can claim three Pharaoh Tournament entry tickets. Tier two of the Golden Pyramid consists of twice-daily Sphinx Tournaments. These are played at 5:00pm and 10:00pm and can only be entered by qualifying via a Pharaoh Tournament, by completing the appropriate Daily Challenge, or by winning an entry ticket in the “Wheel of Ra” promotion. Each Sphinx Tournament has a $2,000 cash prize pool and, again, the top 3,000 players in each tournament will move onto the next tier. The Tutankhamun Tournament is effectively a “Daily Final”. In order to qualify for this 7:00pm event, players must have won their seat in a Sphinx Tournament, completed the appropriate daily challenge or been awarded a seat in the “Wheel of Ra” promotion. The Tutankhamun Tournament has a $4,000 cash prize pool and the top 3,000 players each day qualify for the Rameses Tournament – the $10,000 weekly final. The highest tier of the Golden Pyramid is the Rameses Tournament. The cards are in the air for the weekly final at 9:00pm each Sunday until July 30th, and players can only qualify for the Rameses Tournament by winning their seat in a Tutankhamen Tournament. Nonetheless, if you aim to pick up a respectable share of the $10,000 prize pool, you may have to be prepared for a long night. We expect the weekly finals to be heaving with treasure seekers! To receive an extra Pharaoh Ticket you have to win one BLAST game with a minimum buy-in of $1.00, win ten NL Hold´em cash game hands at stakes of $0.02/$0.05 or higher (heads-up excluded), place five bets of $1.00 or more at the casino (certain games are excluded from the Daily Challenges) or stake a minimum of $5.00 on a Live Sports bet. The criteria gets harder for entry tickets into Sphinx Tournaments. You have to win four BLAST games, forty cash hands, place ten bets in the casino or stake $10.00 on a Live Sports bet. To get a ticket for a Tutankhamun Ticket, it gets tougher still – win eight BLAST games, eighty cash hands, place thirty bets in the casino or stake $25.00 on a Live Sports bet. Players who complete their Daily Challenges will receive their entry tickets within 72 hours, but please note they only have a shelf life of 48 hours once issued. The good news is that players who win multiple seats in the Rameses Tournaments – the weekly finals – can save them up for following weeks. These will not expire until after the last weekly final on July 30th. Real money players at 888Poker will be invited to spin the “Wheel of Ra” when they first log into their 888Poker account each day, and will be eligible for a second spin if they log into their account via the 888Poker mobile app after 5:00pm. The wheel offers various prizes from Golden Pyramid tournament tickets to casino freeplays and free sports bets. Over the course of the promotion the site will be giving away more than $250,000 in “Wheel of Ra” prizes. The balance of the $1 million prize pool for the promotion will be distributed in Gold Tokens via special “Cleopatra Tournaments”. Three daily Golden Pyramid Tournaments will be selected at random each week to be “Cleopatra Tournaments” (one from each of the three lower tiers), and the top one hundred players in each specially-selected event will be awarded 2,000 Gold Tokens. These can be redeemed in the 888Poker Club for $20.00 cash or general tournament tickets. 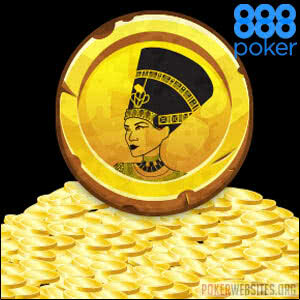 To get the maximum out of the Golden Pyramid promotion, it is ideal to log into your 888Poker account every day. Even if you cannot play in specific Golden Pyramid tournaments, you could still pick up casino freeplays and free sports bets, and who knows what you might win by taking advantage of just these elements of the promotion? To find out more, and to start your ascent up the Golden Pyramid, visit 888Poker today.